The aerial photo map below shows the key waypoints on the route. Resize by clicking on the plus sign and then move map around to see waypoints. 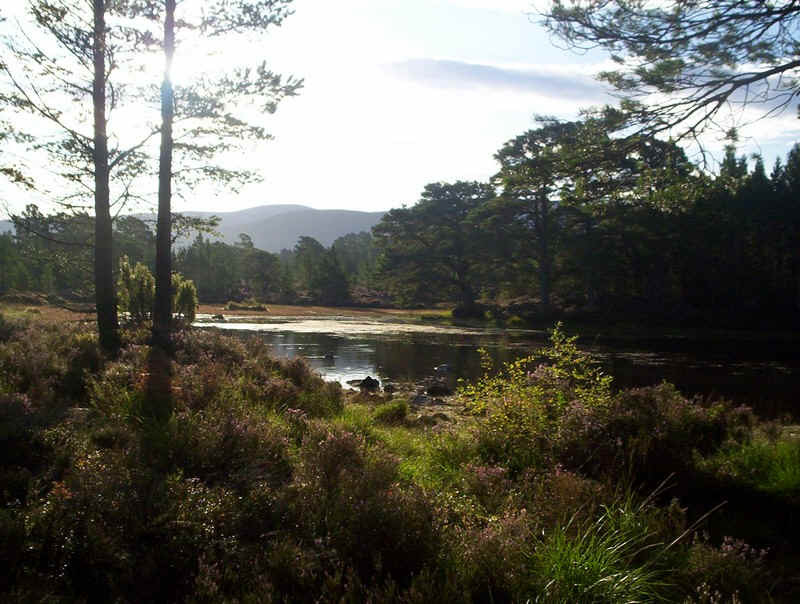 A beautiful September morning in 2009 saw me taking a taxi out to the Whitewell car park just outside Aviemore. I can certainly recommend Weirs Taxis for reliability and a reasonable enough price. 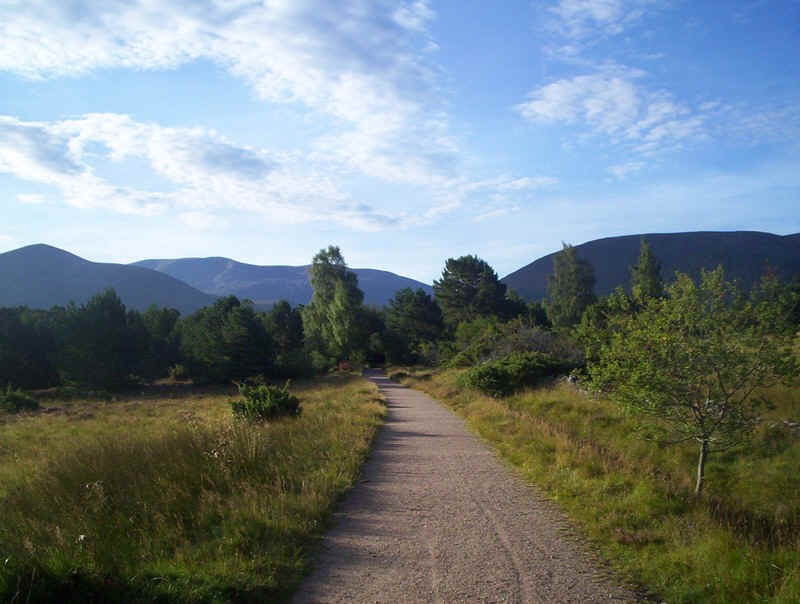 The first few kilometres are very easy walking along tracks through the woods of the Rothiemurchus estate. 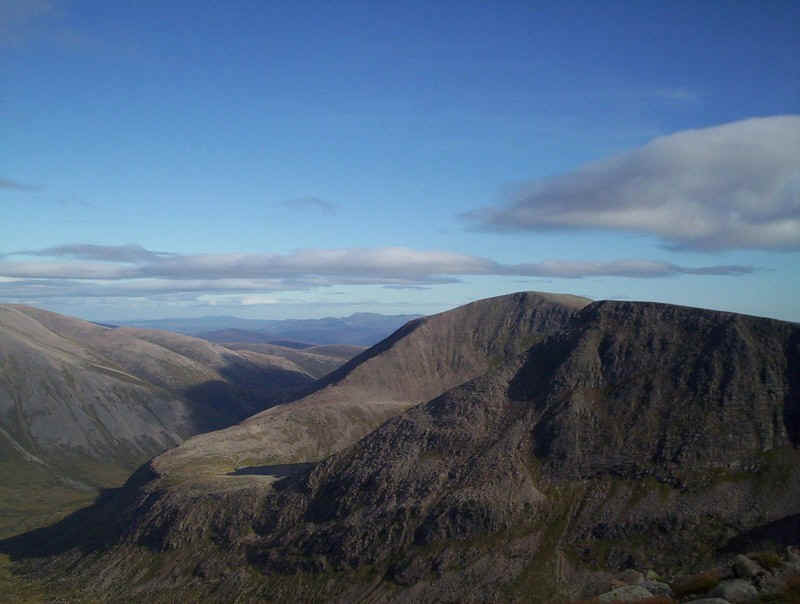 The northern corries of Braeriach dominate the centre left of the photo. 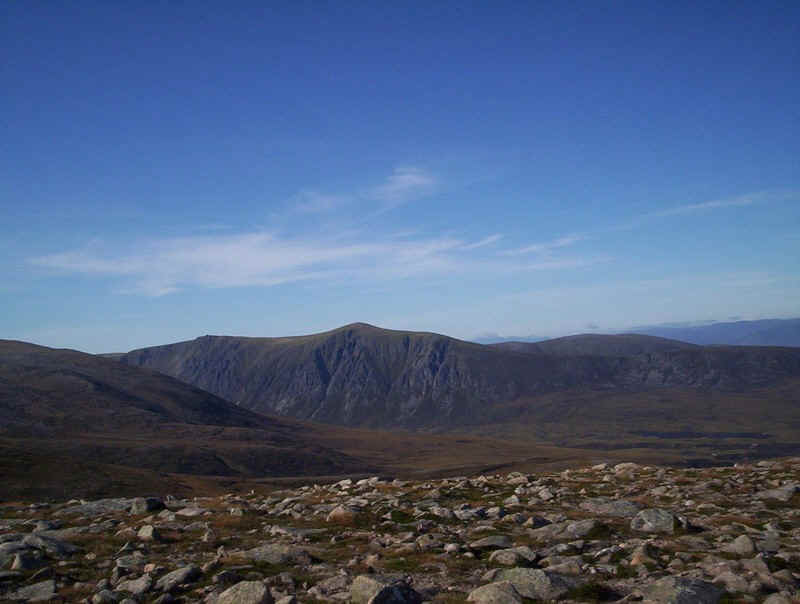 .....shortly before crossing the Am Beanaidh at the Cairngorm Club footbridge. 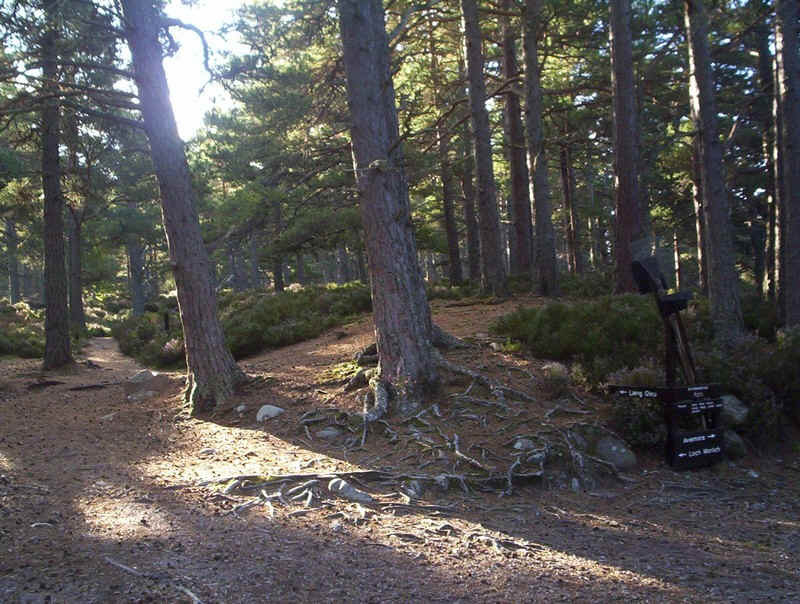 A little further on the path proper to the Lairig Ghru and the mountains starts at this junction in the forest. The well maintain path rises steadily above the river and provides pleasant and easy walking (much appreciated on the return journey). 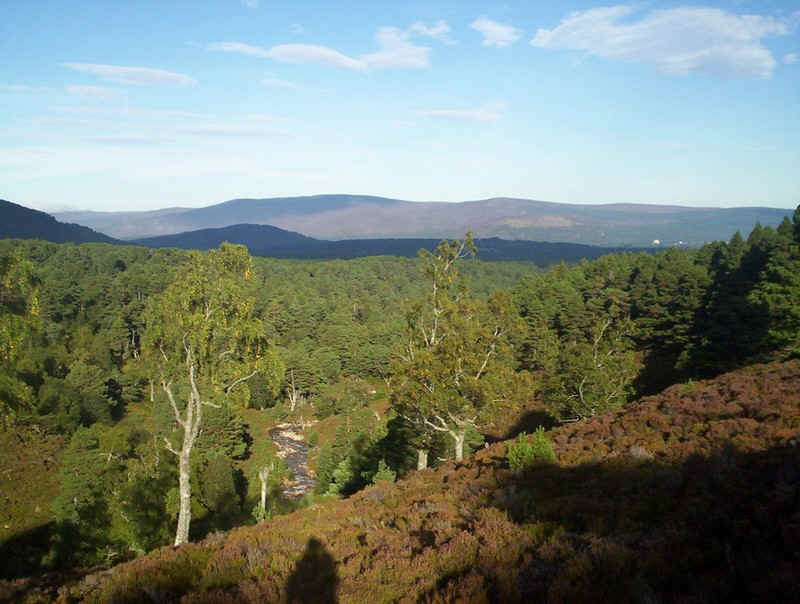 By now the river is some distance below and the trees of the forest stretch into the distance with Aviemore just in view. 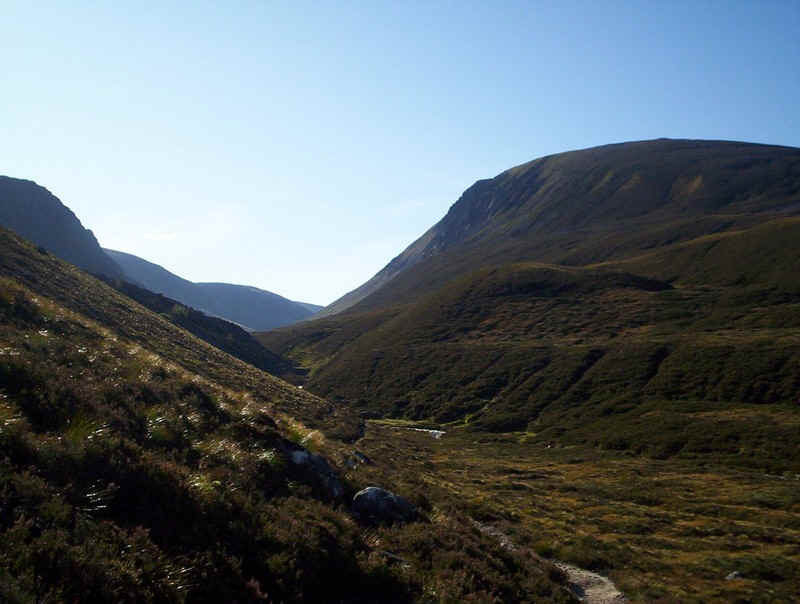 Suddenly the entrance to the Lairig Ghru comes into view. 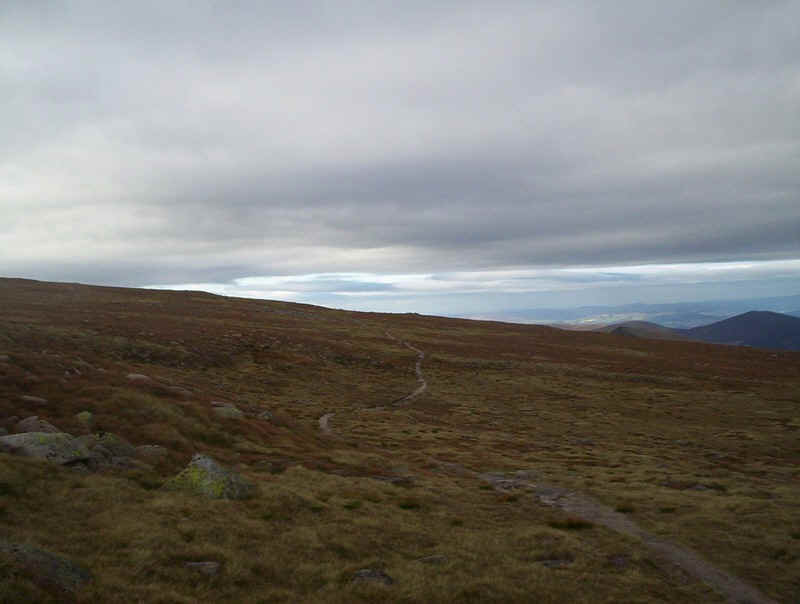 By now the path has become somewhat rougher and the valley floor is at the level of the path. 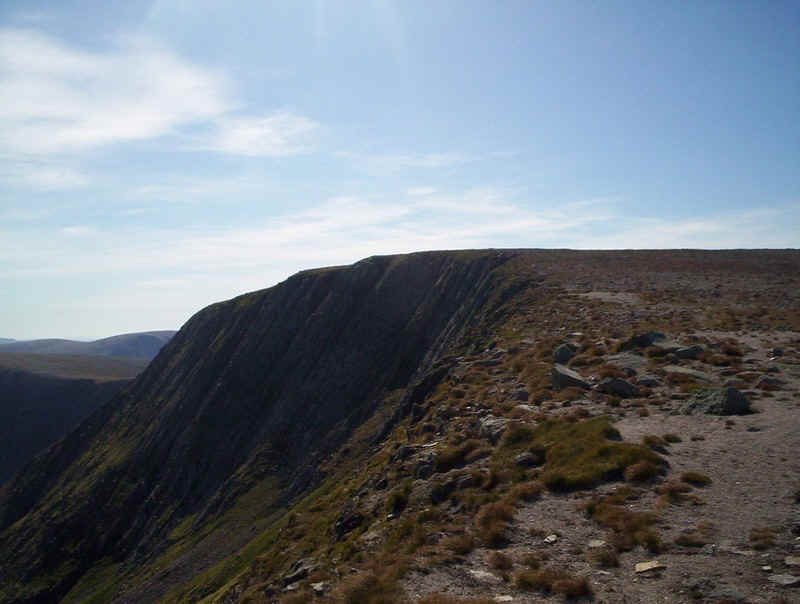 The steepness of the climb up to the right en route to Braeriach is daunting, although nowhere near as steep as it appears at first. 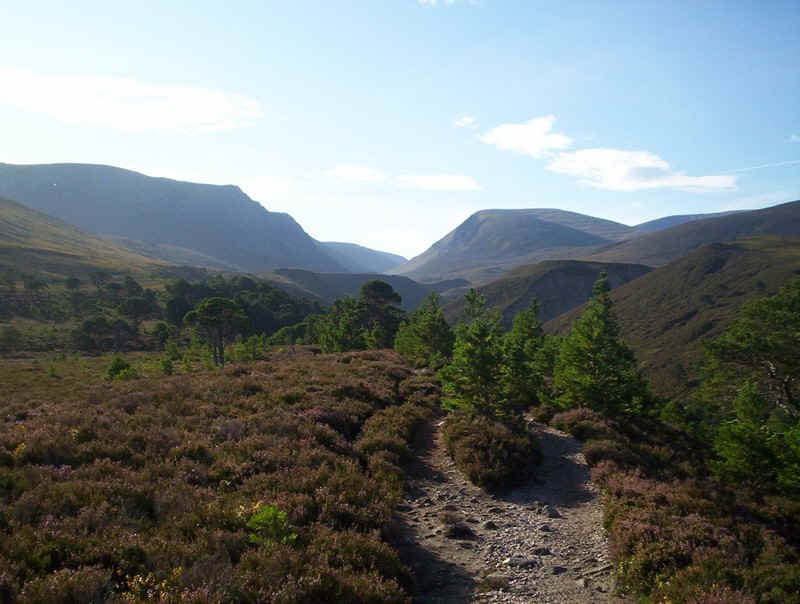 The path from Rothiemurchus meets the on through the Chalamain Gap and suddenly reaches this intriguing spot, where the Allt Druidh appears out of the hillside, almost as if out of a spring. In reality the river runs in a natural tunnel under the rocks and hillside for a short distance. 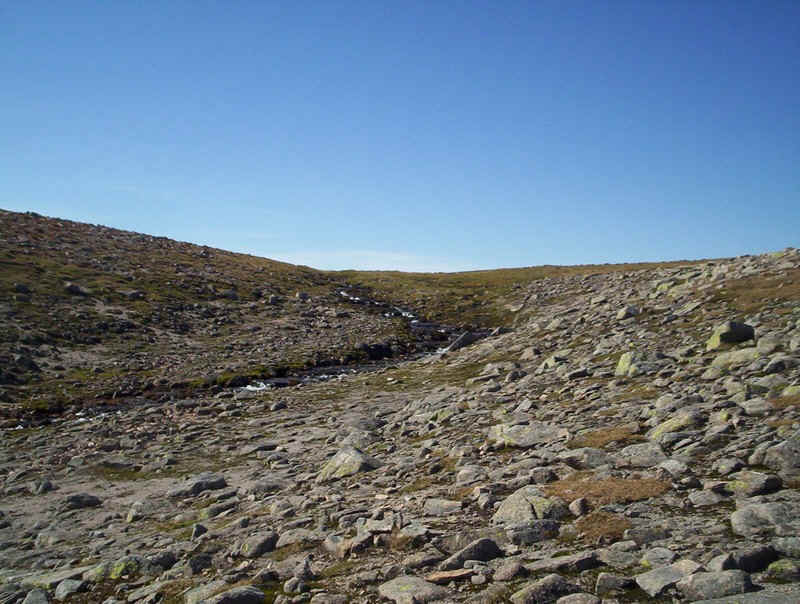 The boulders make for an easy crossing of the stream. To reach this point it had taken me exactly two hours from the car park. 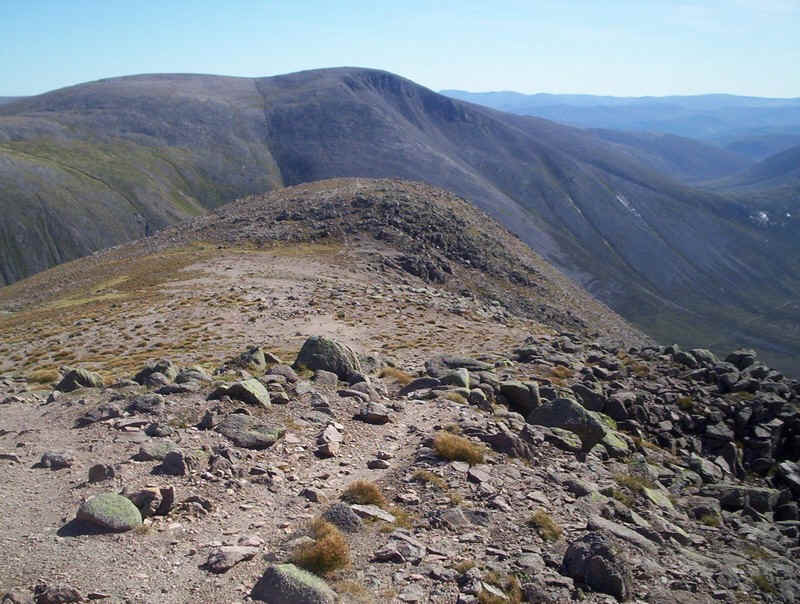 The path through the Lairig Ghru climbs steeply up a constructed staircase to reach a new path to Braeriach. Be warned that the original path is now in a very eroded and dangerous state and should be avoided on the return. On the way back downhill take the new path which bends around to the right rather than the obvious direct path. The new path is a delight but don't worry it soon disappears and the hard work begins. Looking downhill the old eroded path can be seen in the lower centre of the photo with the new path curving around to the right. The Chalamain Gap path can be seen climbing uphill to the boulder strewn gully at the crest of the slope - not a good route in my opinion. 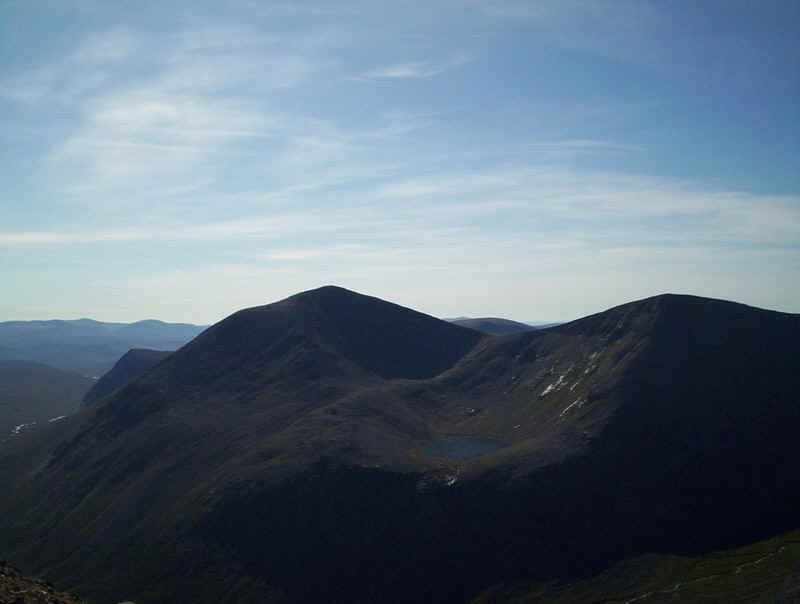 .....with Braeriach's two northern corries. 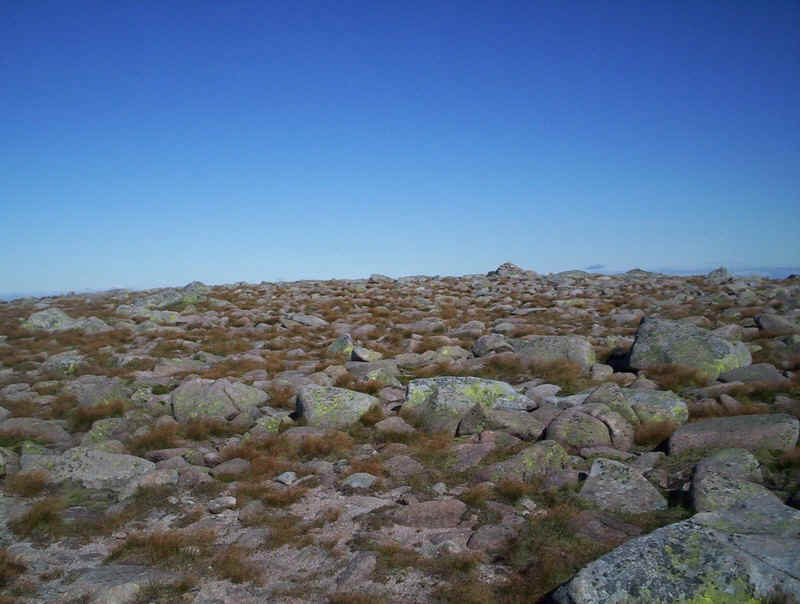 The way forward is a mixture of boulders, gravel, small stones and the occasional thin grass. 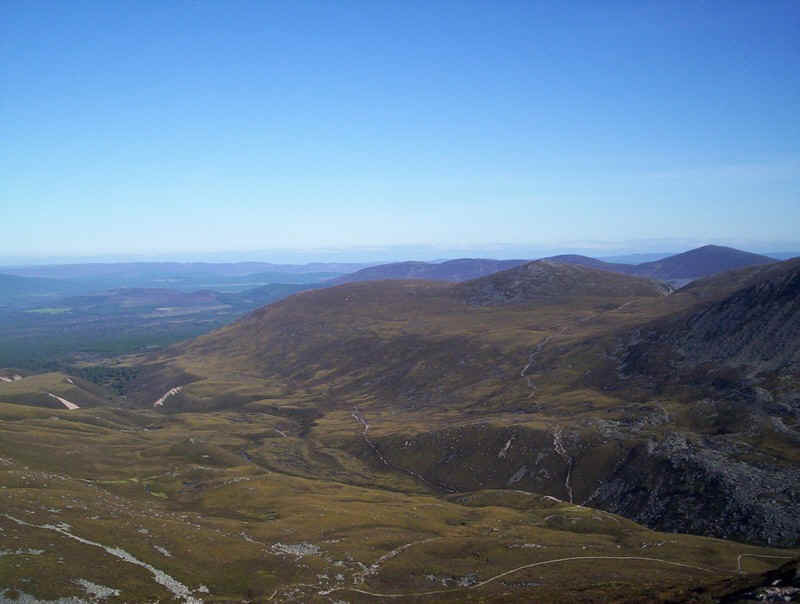 In the distance is the first objective of the day; Sron na Lairige at 1184m. 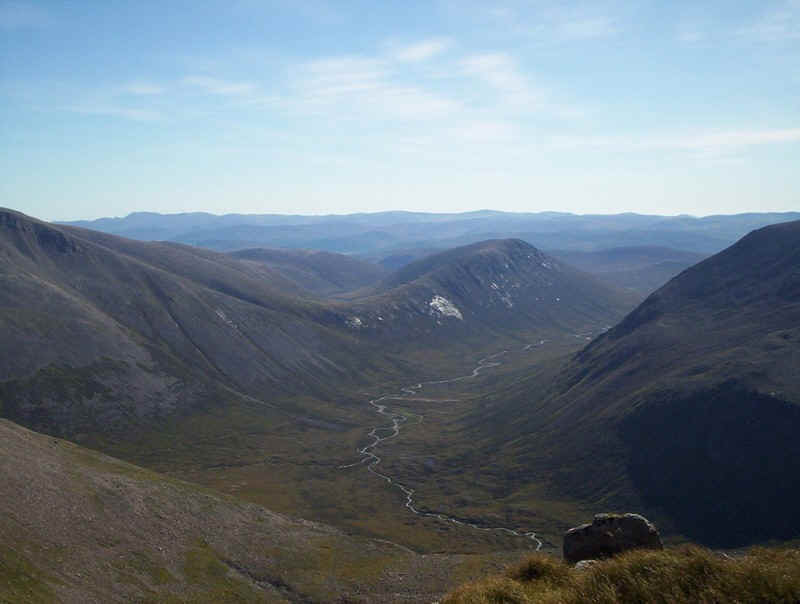 Looking down into the Lairig Ghru - what can be said about this incredible location? Directly across the valley is Creag an Leth-choin (or Lurcher's Crag). 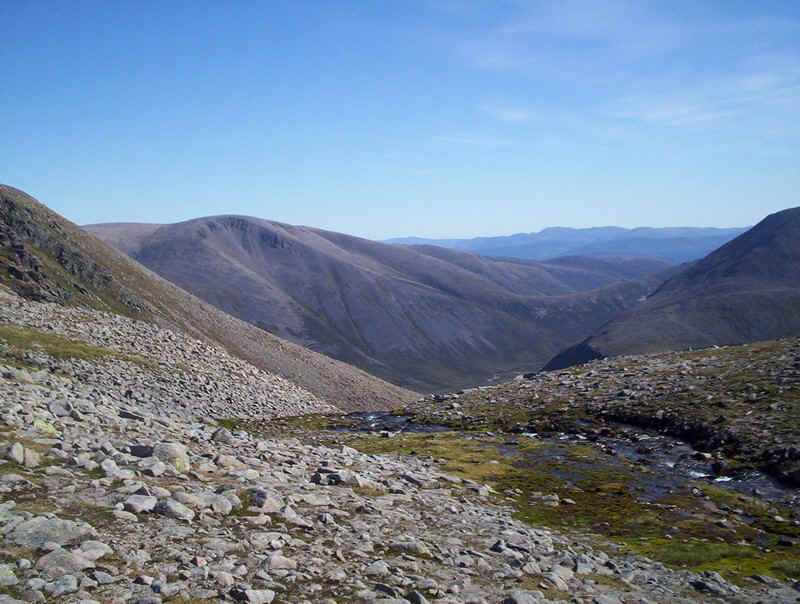 .....with Ben Macdui across the Lairig. 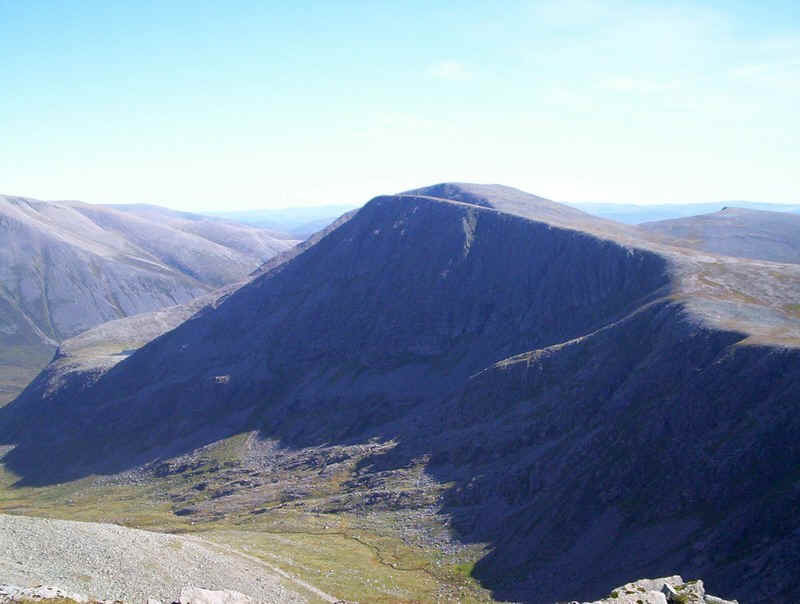 Peeping over the summit of Sron na Lairige is Cairn Toul. 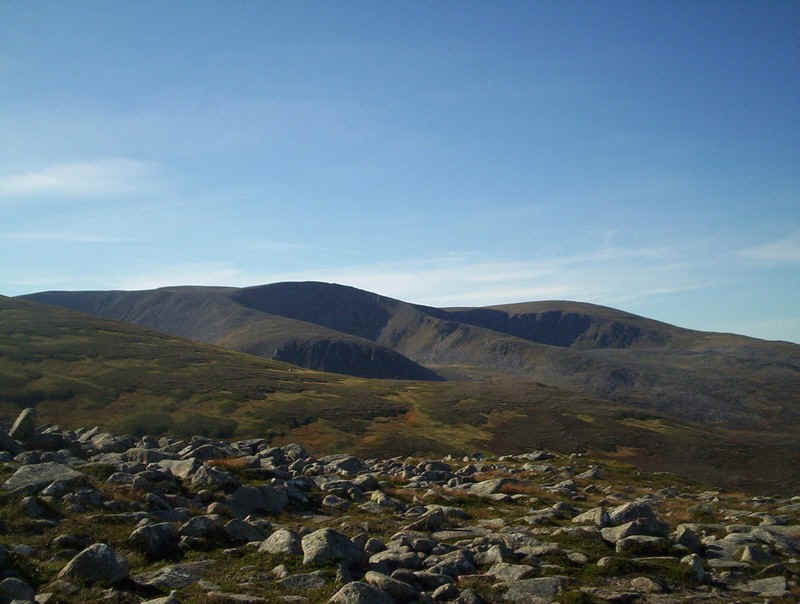 I'd hoped that my progress would allow me time to go on to climb Cairn Toul and still be back at Coylumbridge before it got dark. My route plan timings were looking positive as I was now well in advance of my projected timings. 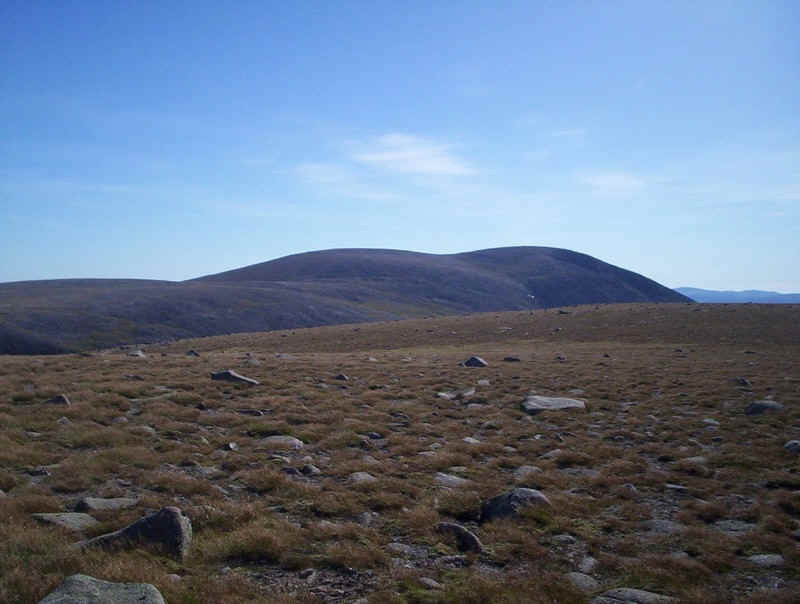 More round boulders litter the summit with Sron na Lairige's cairn in the distance. 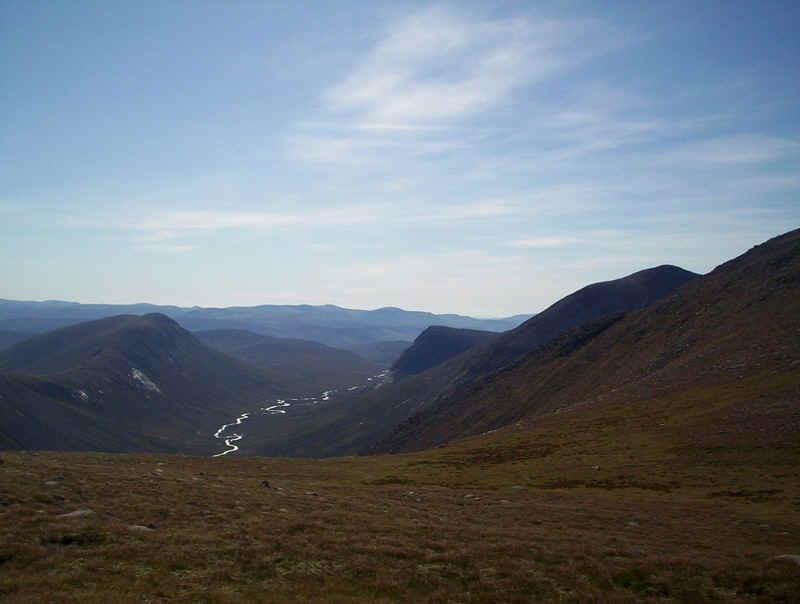 ......and the view down the Lairig Ghru towards Corrour with the sunlight glistening on the river. 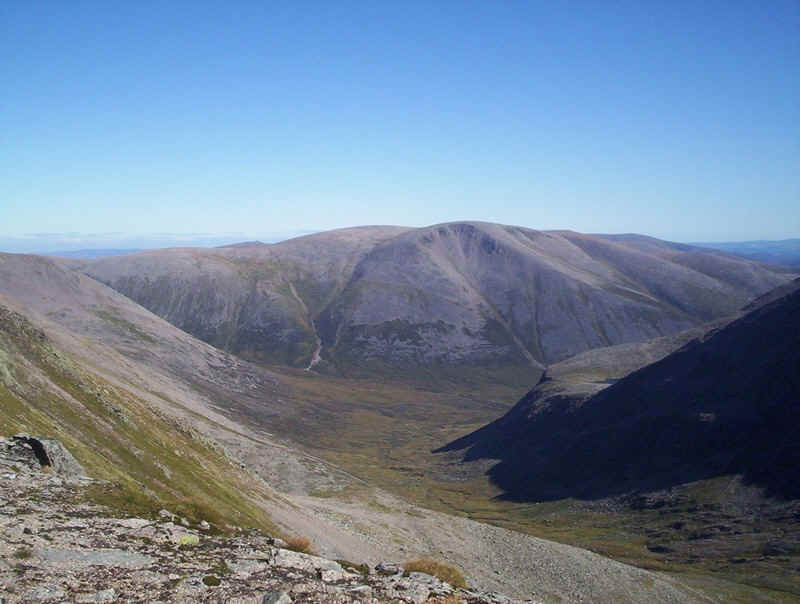 The sheer scale of the corries between Braeriach and Cairn Toul takes the breath away as can be seen in the next three photos. 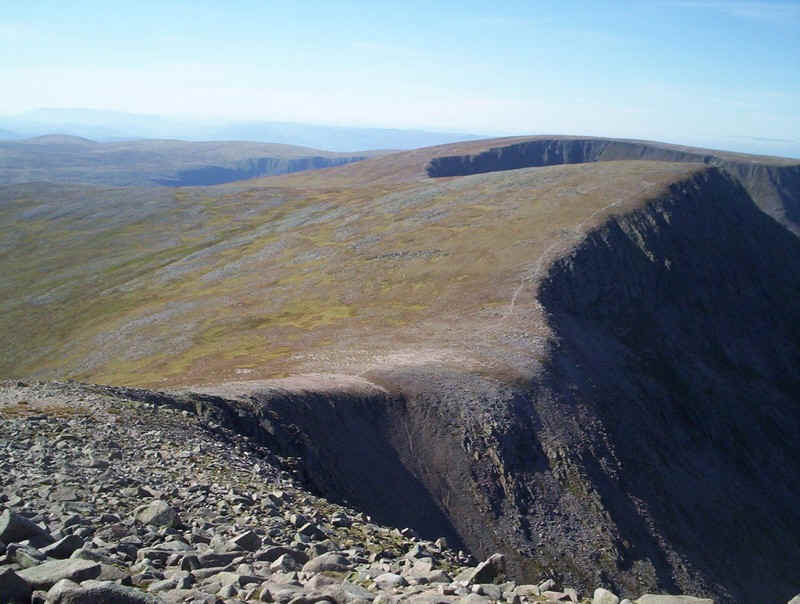 Four huge subsidiary corries are enclosed in this one enormous corrie. 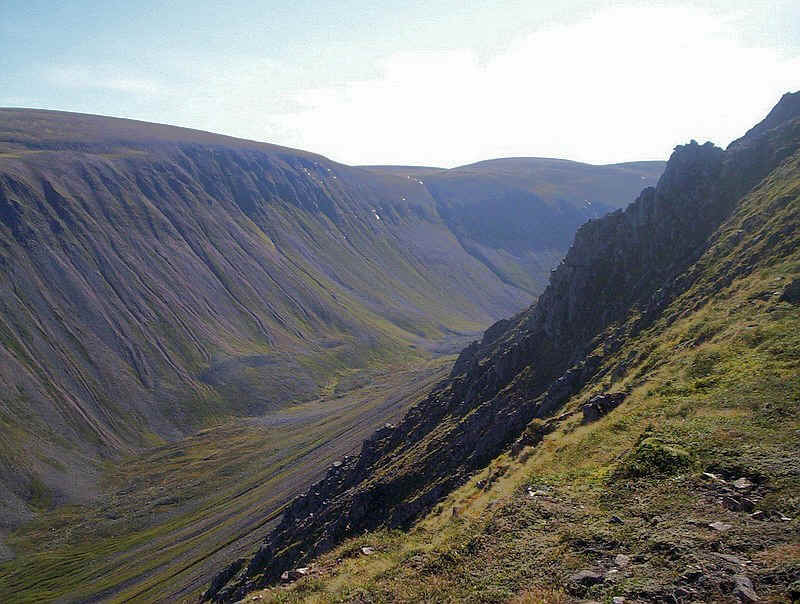 ....Sgor an Lochaine Uaine again with the cliffs of Cairn na Criche and one of the spurs leading down from Braeriach on the right. 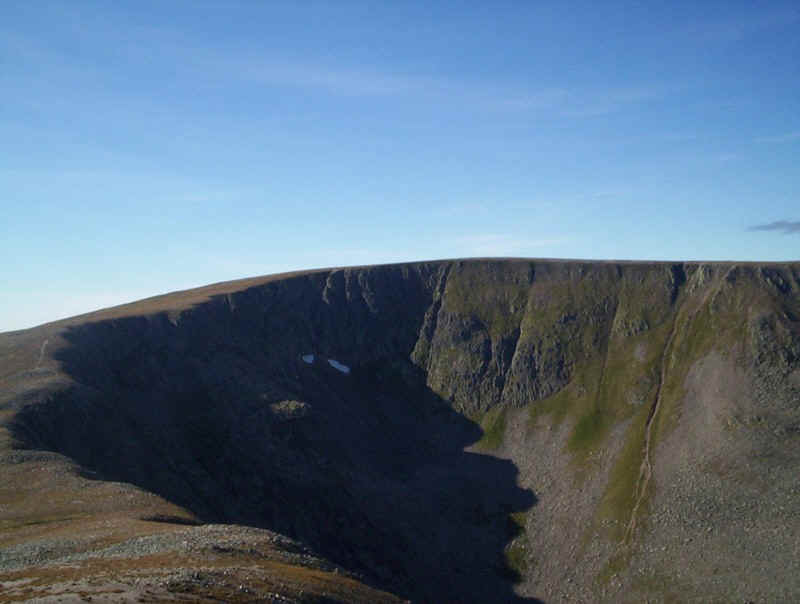 .....and Coire Bhrochan below the summit of Braeriach - totally awe-inspiring. Click on the photo to see the image full size. 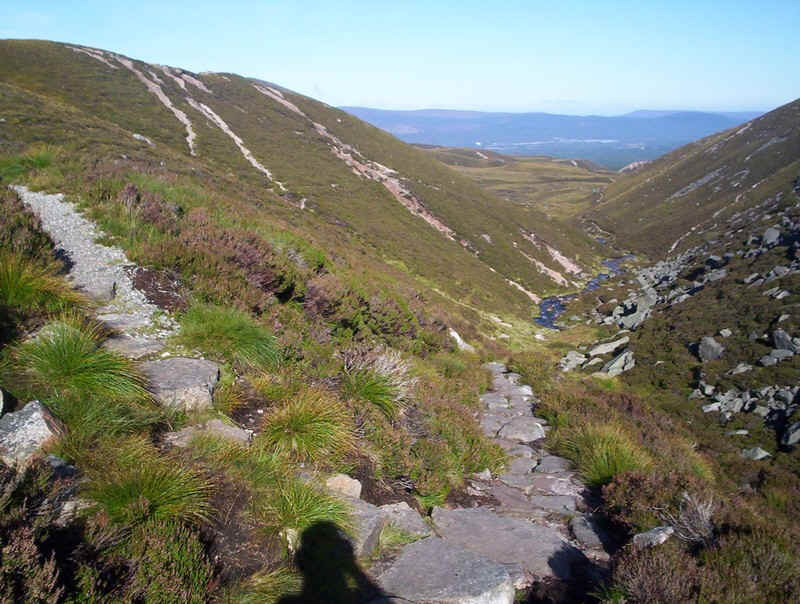 .....and down into the corrie with the Allt a'Gharbh-choire leading to the River Dee. 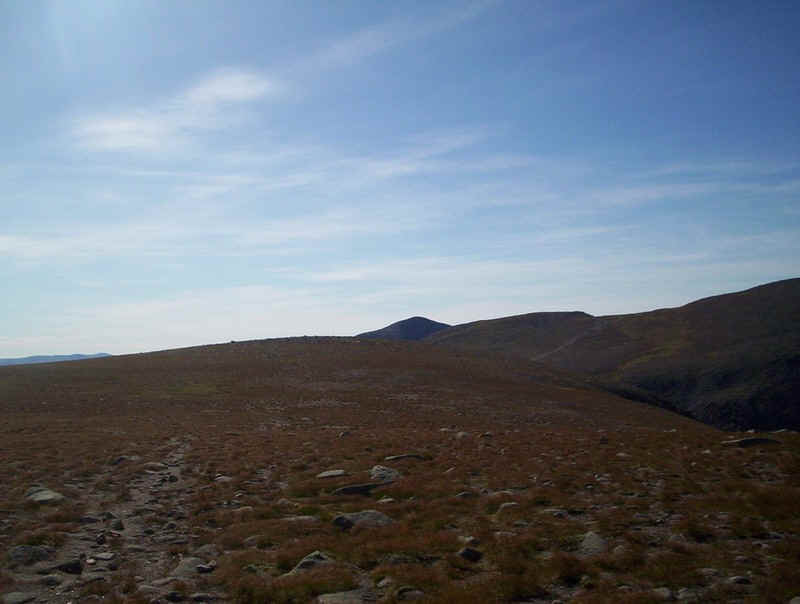 Braeriach's summit at 1296m (and the third highest hill in Britain) was reached 4 hours and 10 minutes from Whitewell and over an hour earlier than I'd expected. 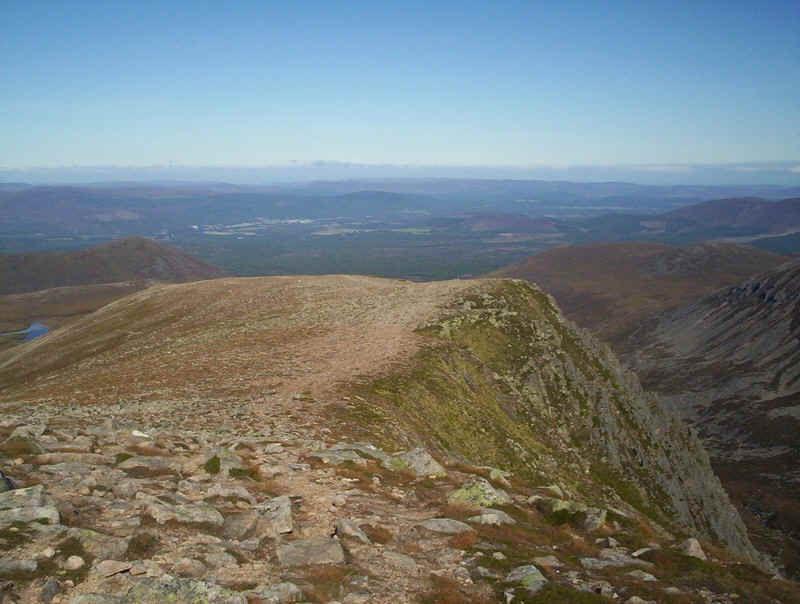 Braeriach was my 71st Munro and thus I'd reach the total of a quarter of the Munros with this hill; except of course that since one of the 284 Munros was actually not a 3000 footer there are only 283. This rather mucks up achieving a quarter, a half and three quarters doesn't it? 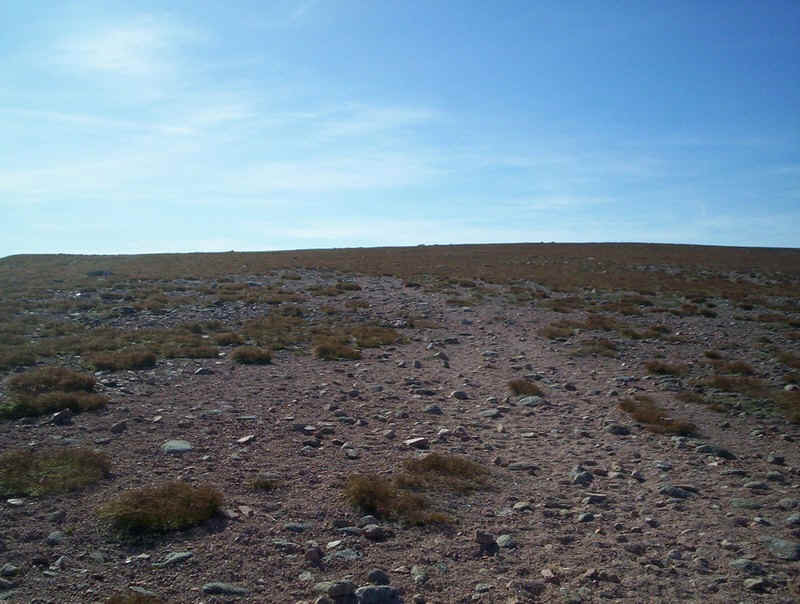 A quick snack at the summit and I was ready to go on to Cairn Toul. 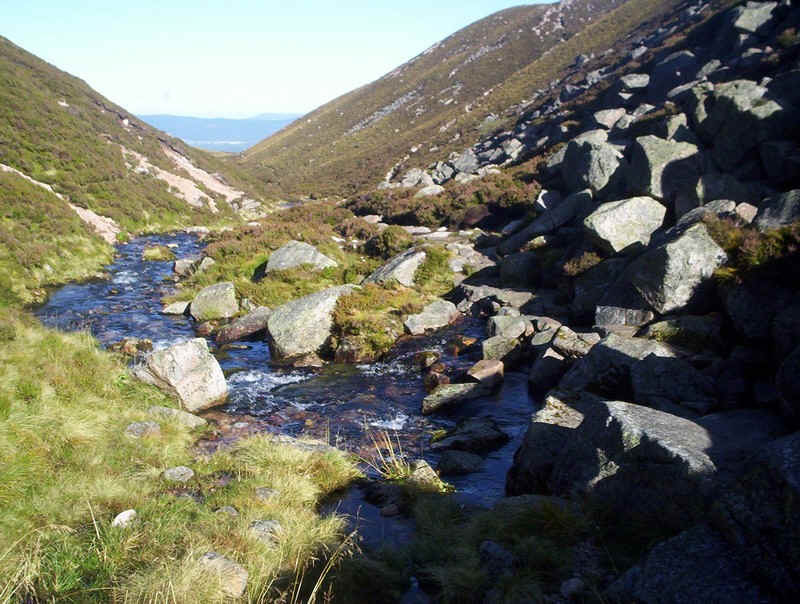 The River Dee begins its journey here at the Wells of Dee. Fortunately there wasn't much water in the stream and it was easy to cross. 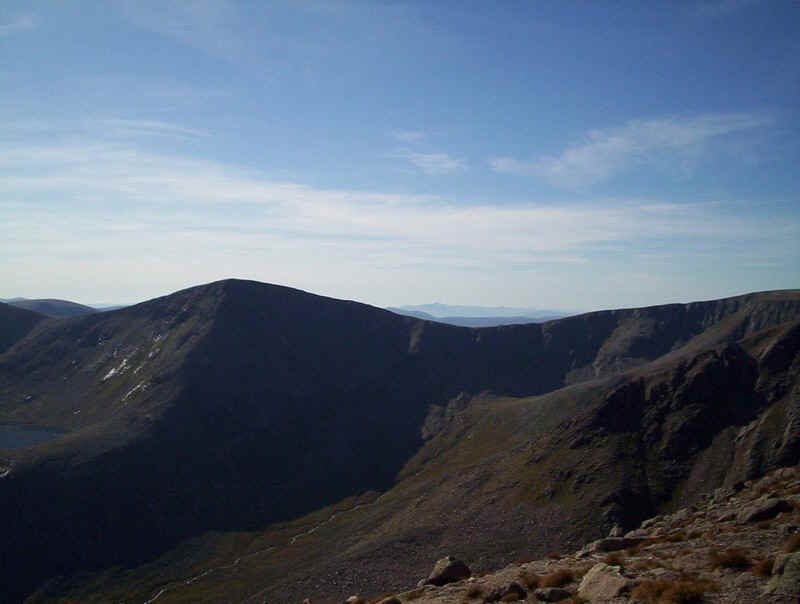 Ben Macdui across the Garbh Coire and Lairig Ghru. 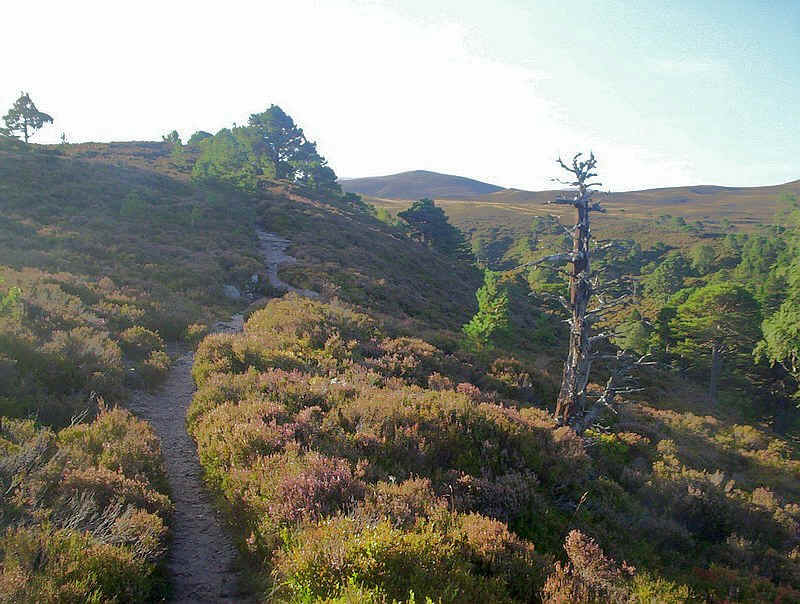 There's a drop down before the ridge climbs to the summit of Sgor an Lochain Uaine - an absolutely delightful stroll in the early afternoon sun. 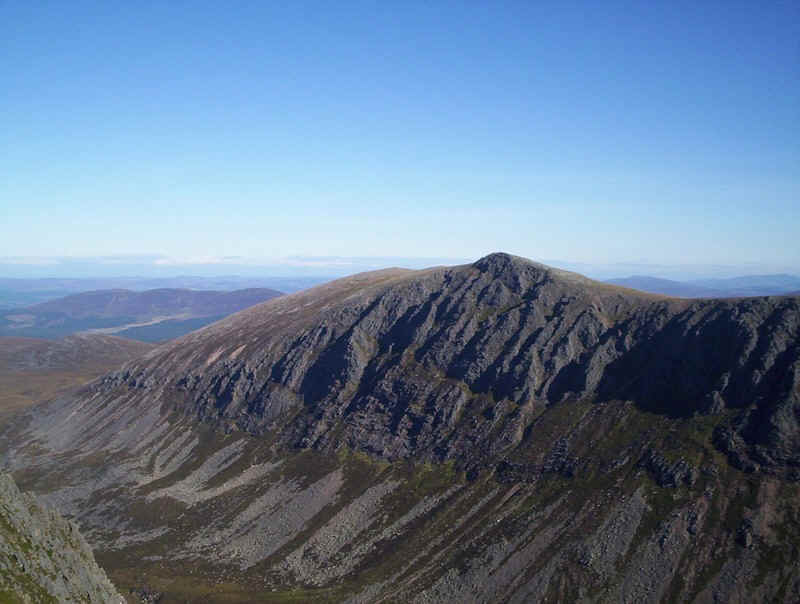 I must now admit to an awful truth - I didn't climb Sgor an Lochain Uaine. 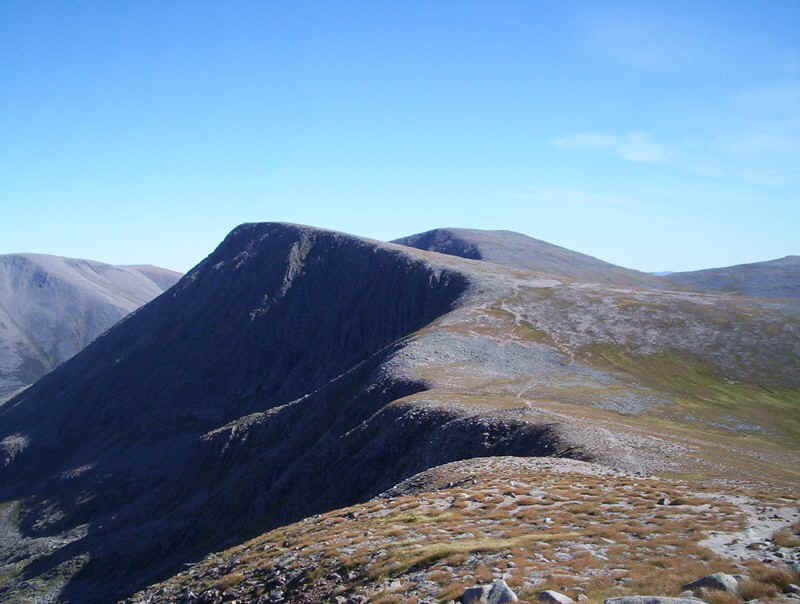 For some reason I hadn't looked closely at the Munro lists when planning the route and hadn't realised it was classified as a separate Munro. 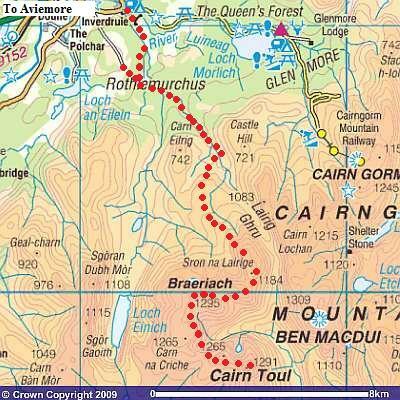 This mistake was compounded by me using a pre 1997 Harvey's map which, of course, didn't highlight the hill as a Munro. 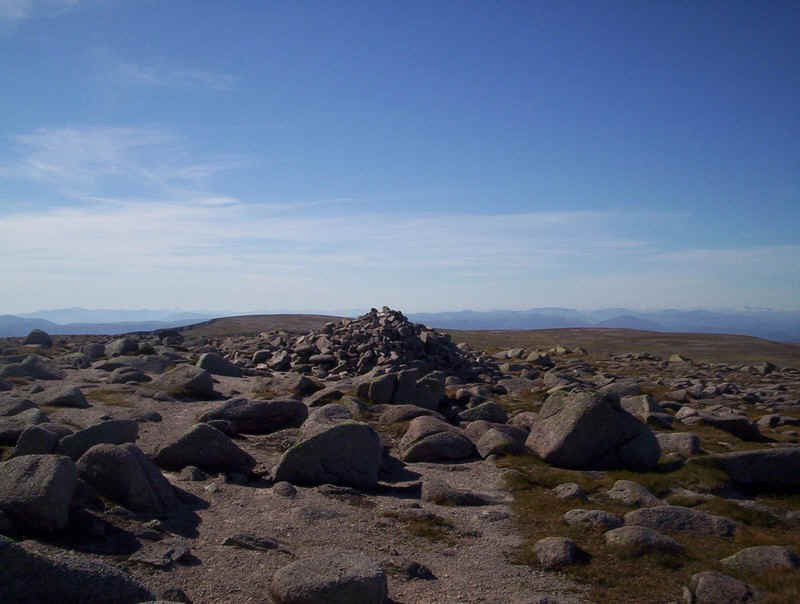 My time was short as I really wanted to get back to Coylumbridge before dark and, looking at the height gain to the summit, I was convinced that it couldn't be a separate Munro. 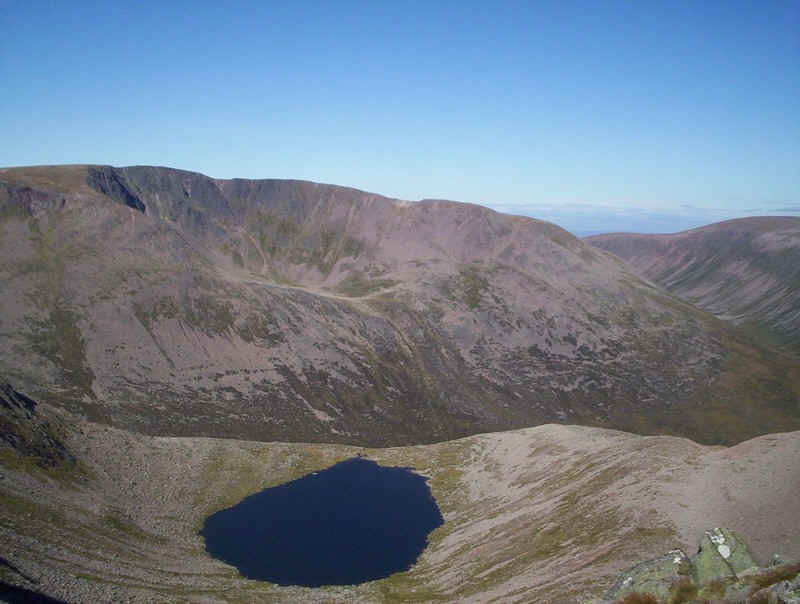 It was only when I checked something about Cairn Toul on the internet that evening that I realised my mistake. 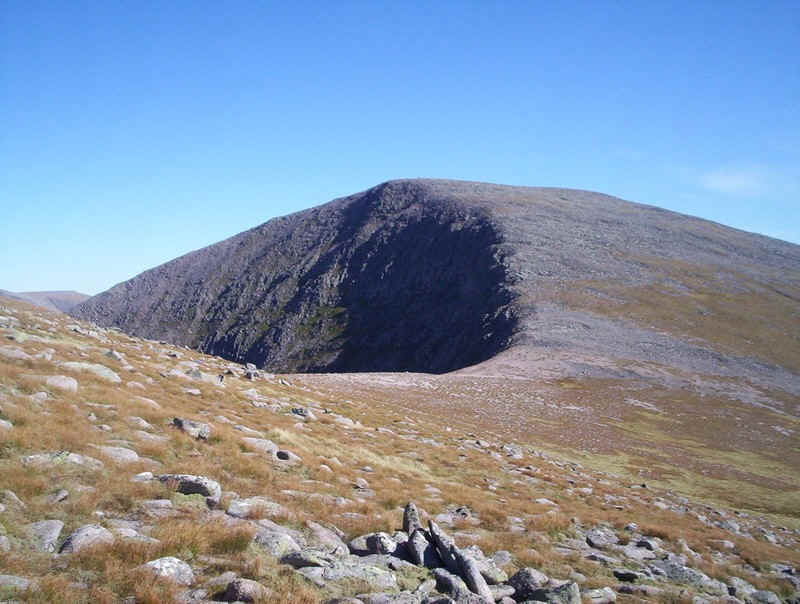 I have to admit a slight sinking feeling but, fear not, I have a plan to visit this peak when I climb the Devil's Point. 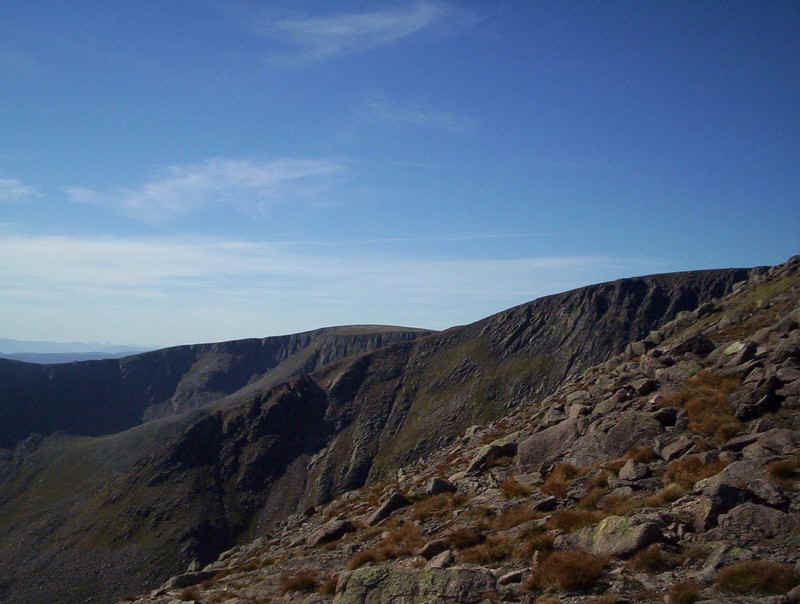 Being controversial, I am puzzled by the inclusion of Sgor an Lochain Uaine as a Munro given the modest height gain (118m) from the bealach between it and Cairn Toul. ......but views such as this give an excuse for a brief pause in the labour uphill. 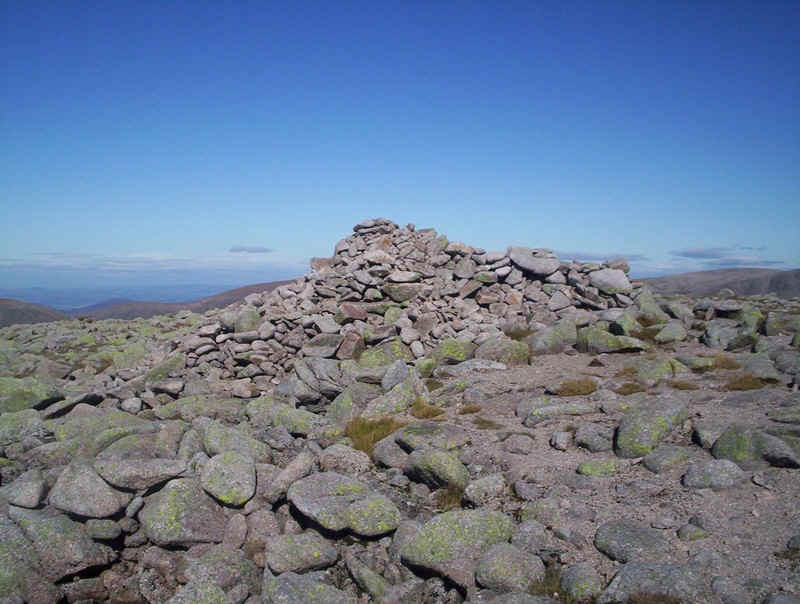 The summit cairn of Cairn Toul (1213m) reached 1 hour and forty minutes from Braeriach. 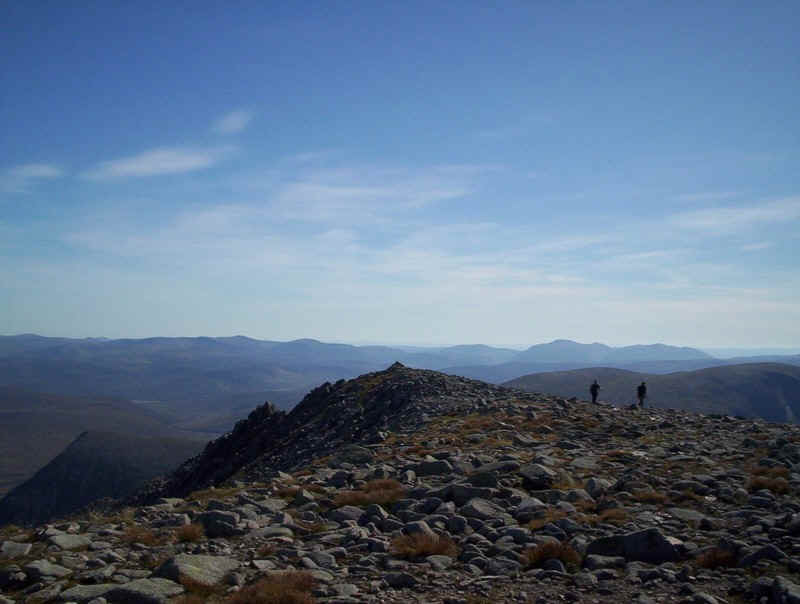 A panorama looking towards Ben Macdui on the left and Carn a'Mhaim on the right. Click on the image for a larger view. 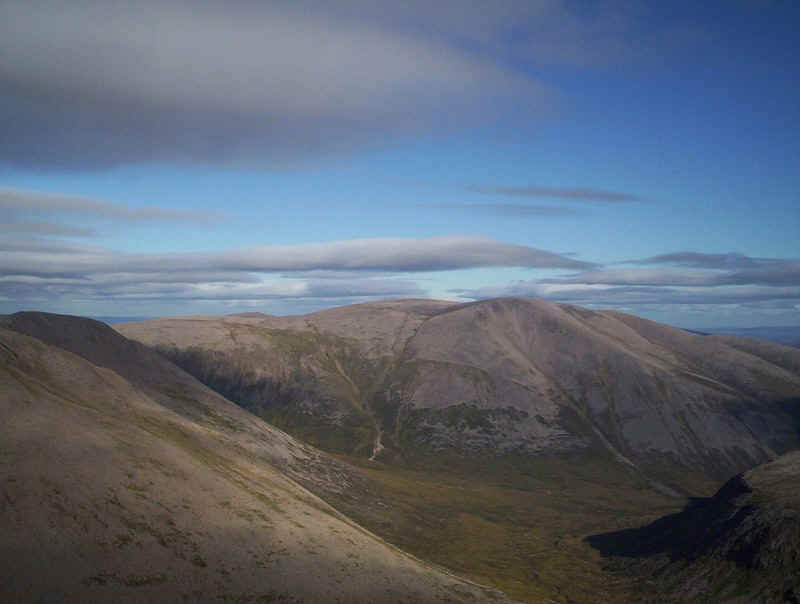 The view from the summit looking north east. Two other walkers insisted on all of us taking photos of each other so here I am! Looking down over the boulders on the return. The clear path (and the lack of height gain) are obvious but, clearly, I'll have to return one day. My route took me directly across the hillside to the cliffs in the distance. 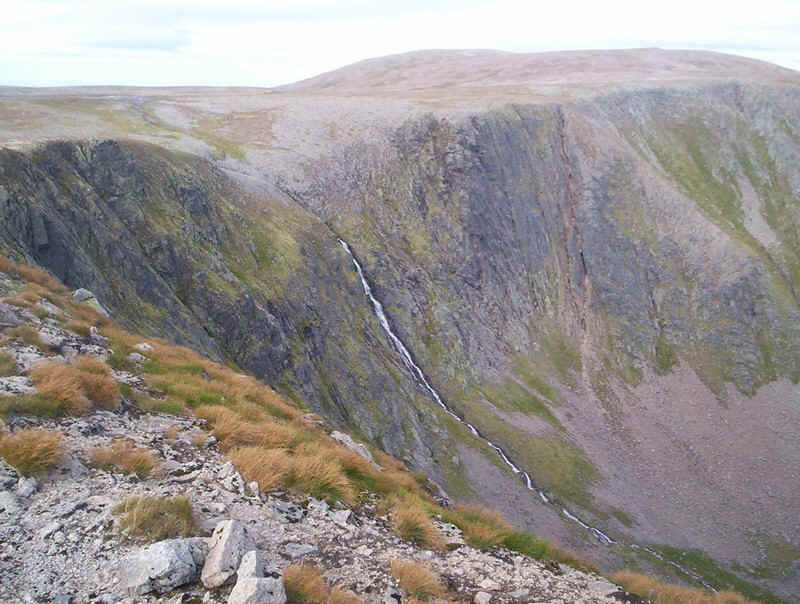 The Falls of Dee tumbling into Gharbh Coire. 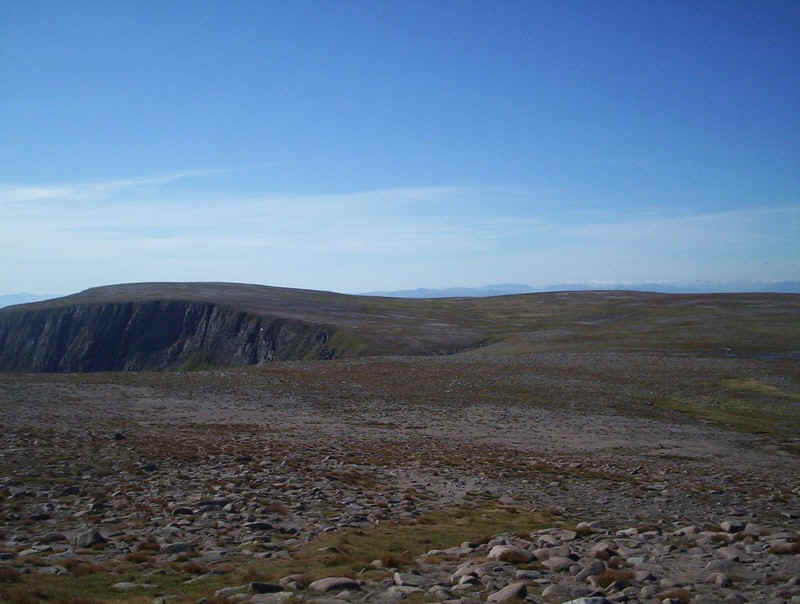 Even in mid September there were a few patches of snow left under the cliffs of Carn na Criche. 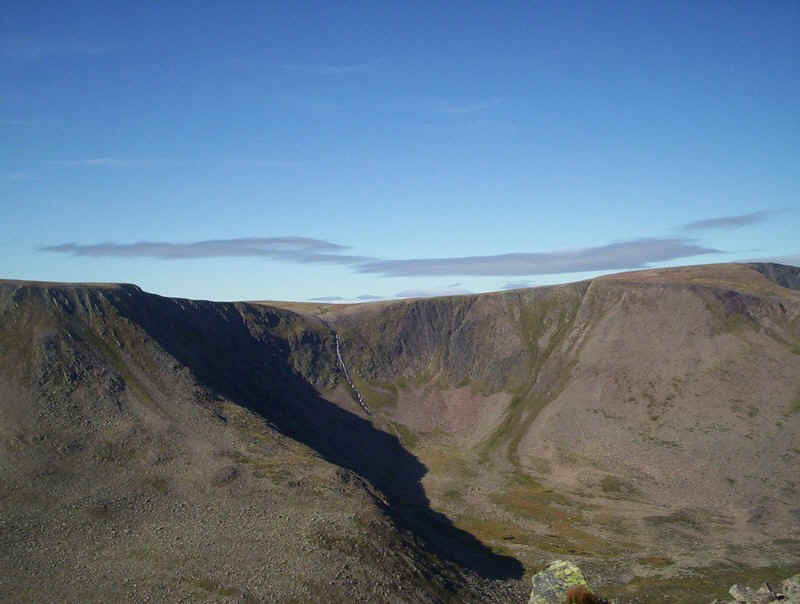 Lighting conditions make a tremendous difference to photographs as this view of Cairn Toul and Sgor an Lochain Uaine, taken just after 5.00pm shows. 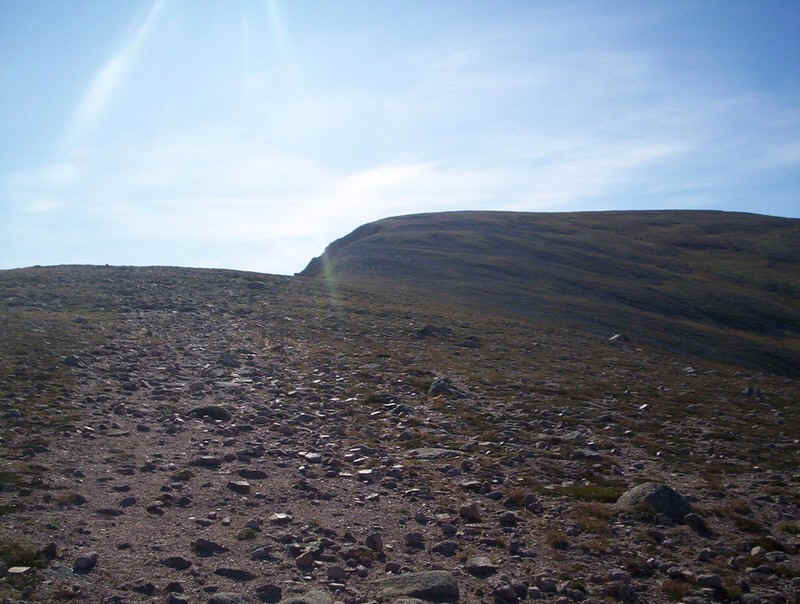 The reddish tint of the rocks of Ben Macdui are obvious in this photo. A close up view of the Falls of Dee. 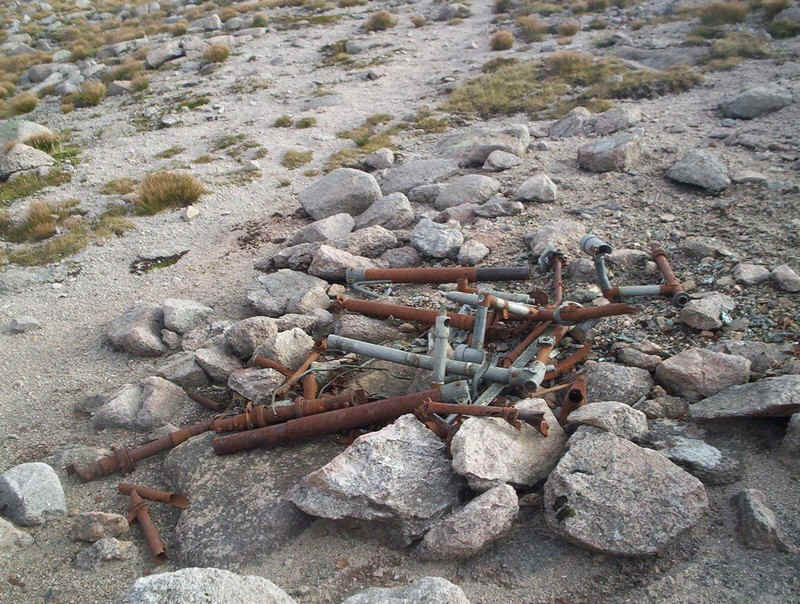 Just below the summit of Braeriach this wreckage from a Bristol Blenheim aircraft still lies by the path. This link takes you to further details of this 1945 crash. 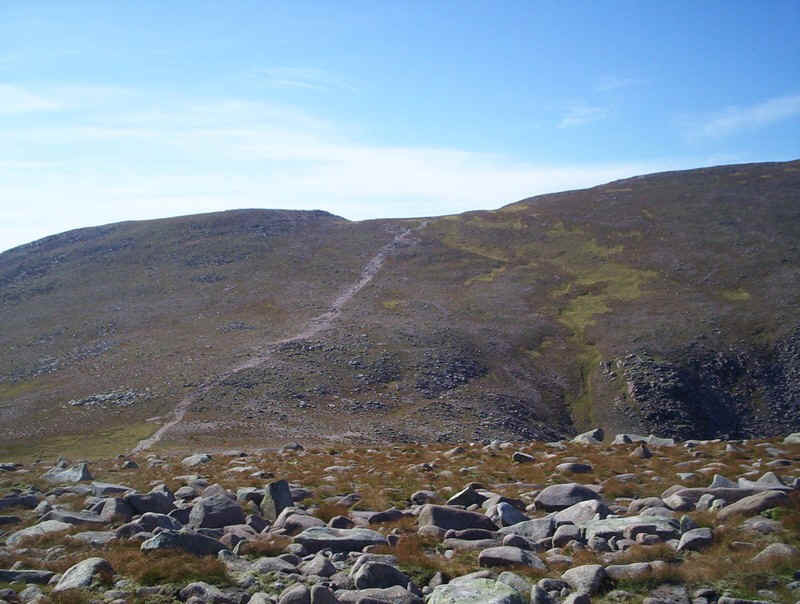 On the return from Braeriach I took a slightly different route to the outward walk following a path slightly below the crest of Sron na Lairige on its eastern side. By now I was very much in yomping mode as I attempted to get back to Coylumbridge before dark. 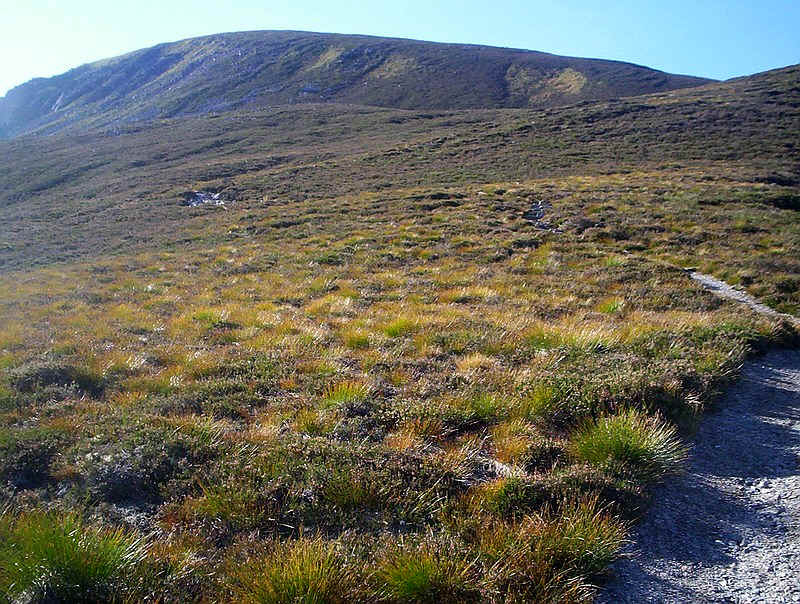 Apart from taking the wrong path down to the Lairig Ghru path (referred to earlier) the return was uneventful. 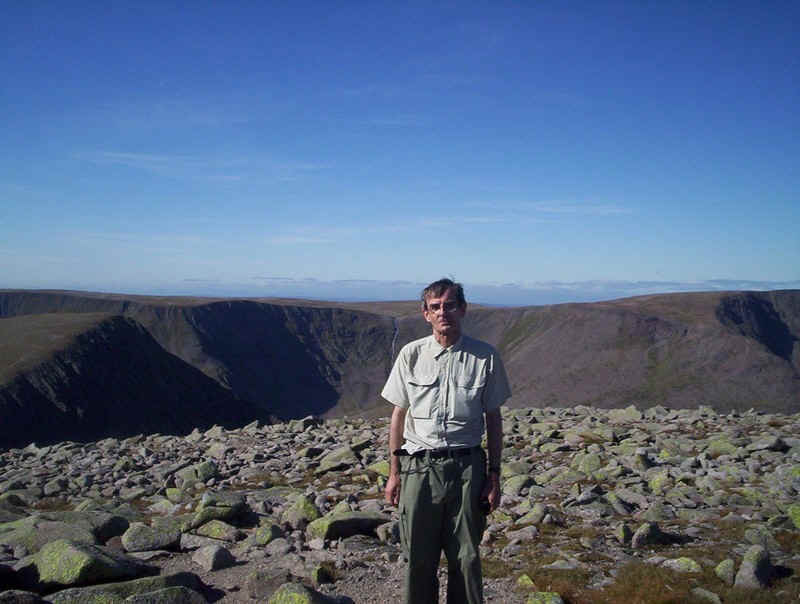 I met a couple of men setting up camp at the entrance to the Lairig Ghru; I felt somewhat envious of them given the weather conditions that evening. 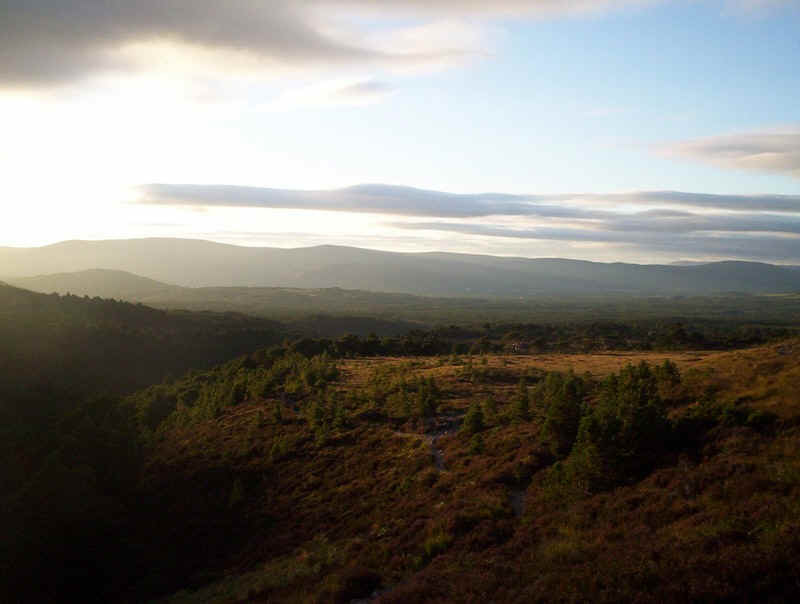 The final photo of the day as I approached the Rothiemurchus forest. 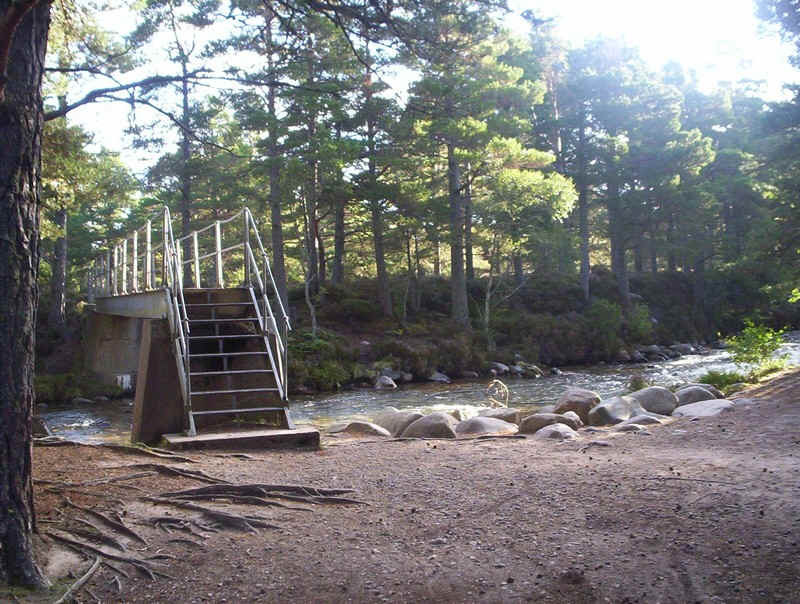 Rather than return to Whitewell, I took the broad forest track from near the footbridge to the campsite at Coylumbridge, where Weirs taxis provide me with transport back to Aviemore within ten minutes of my phone call. The walk had been 40okm long and taken exactly twelve hours (including breaks totalling about an hour) with the last half hour or so of the walk through the forest in the dusk. A truly memorable day.